After the unexpected action from the overall contenders on Stage 3, there was no chance for the likes of Bouhanni and Nizzolo to make it to the end to contest the finish. Stage 4 will be all about the GC contenders again it would seem. A long 190km flat section before the stage really gets underway should see a breakaway going away. 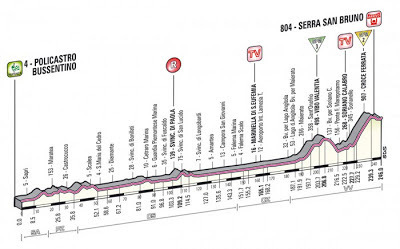 However, there is again little chance of it staying away as the stage really starts with the climb up Vibo Valentina with an average gradient of around 6% for the majority of the climb. After that, the final climb up Croce Ferrata, the category 2 climb that averages 5.6%, but rises to over 10% at times. With just 6.7km, it would be possible for a small group could stay away over the top down to the finish at Serra San Bruno. So, that moves us onto looking at the potential winners of this stage. After Team Sky struggled to control the race in Stage 3, it would seem likely that their rivals will attack again either on the Vibo Valentina, or more likely, on the Croce Ferrata. Ryder Hesjedal attacked both on the ascent and the descent in Stage 3 showing his form and, given his post-race comments, it would be no surprise to see him go again. Among the other contenders that might fancy going for it are the Italian trio of Vincenzo Nibali, Mauro Santambrogio and Michele Scarponi. Nibali and Santambrogio both looked in good form in Stage 3, while Scarponi was in contention until a crash forced him to wait for a new bike, losing him plenty of time. While the likes of Evans and Wiggins should be in the final reckoning, it would be a surprise were they to actually win the stage itself, although the bonus seconds available to the first few places will tempt the leading riders to try and outdo their rivals on the line. The climbers will also be eyeing up a stage win. Carlos Betancur is strongly fancied to do well in this Giro and he has been in excellent form in recent months. 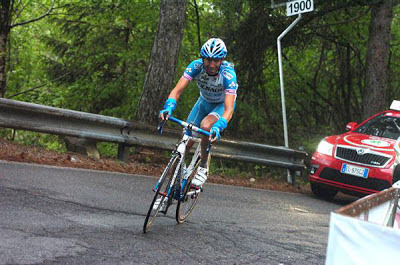 He is excellent on the climbs and will know that he has a chance for a victory here. The likes of Stefano Pirazzi, Stefano Garzelli, Matteo Rabottini, Domenico Pozzovivo and Giovanni Visconti are all eyeing up the King of the Mountains jersey, so might look to attack to take the points at the top of Croce Ferrata and potentially the stage win. Mauro Santambrogio is the favourite in the betting and with good reason. He is one of the best climbers in the field and is certainly one of the fastest finishers of the group that is likely to contest the stage win. Surprisingly, the bookmakers seem to make Cadel Evans the second favourite and I would certainly not be touching him at these odds. While he might fancy trying to contest a sprint finish for the bonus seconds, I am not convinced that he will be winning this stage. He is closely followed by Hesjedal, Sanchez and Nibali which makes sense. 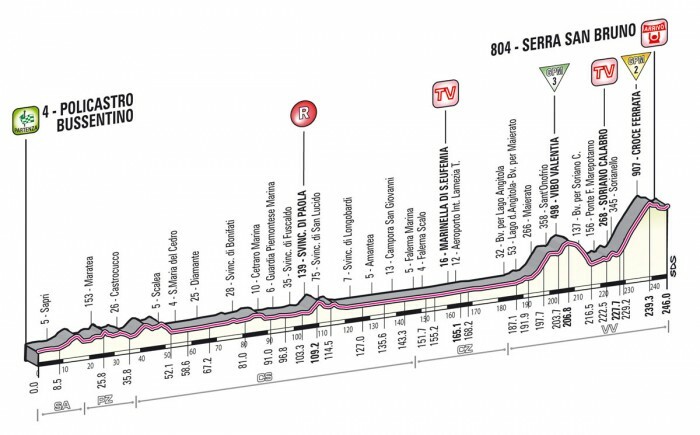 If a group reaches the finish, Santambrogio should win this. He will be the fastest finisher of the group and wants a stage win in this Giro. However, there is every chance that one of the Italian KOTM contenders could attack alone, and given they are already well down on the GC, they may well be allowed to go away and win the stage. The recommended bets reflect this.